A Higgs Nobel? And to Whom? 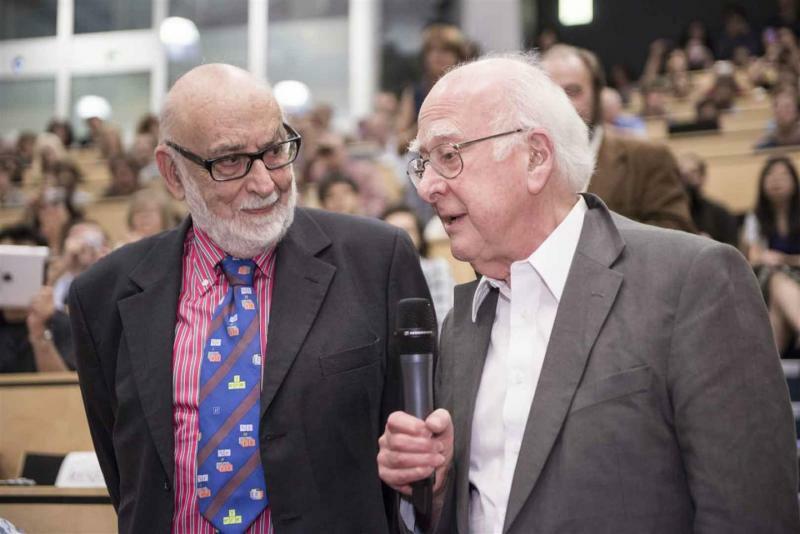 The smart money for this year’s Nobel Prize, it seems, is on Peter Higgs and François Englert to win for developing the theory of the boson that bears one of their names. Awarding the prize to the two of them would, of course, be a great oversimplification of assigning credit for that theory. Robert Brout, who worked with Englert, died in 2011 and so is ineligible for the prize. Gerald Guralnik, C. R. Hagen, and Tom Kibble published independent work on the same problems at the same time. All six shared the 2010 Sakurai Prize “for elucidation of the properties of spontaneous symmetry breaking in four-dimensional relativistic gauge theory and of the mechanism for the consistent generation of vector boson masses,” but the Nobel rules are more restrictive. If the Nobel Prize goes to only two of six theorists, it is certainly in the tradition of the prize, whose structure implicitly assumes that great scientific breakthroughs are made by great people through well-defined leaps of genius. More often, though, theoretical work is incremental. Ideas are exchanged, developed partially by one person before being expanded upon by the next. The positive way to look at it is that the prize would be symbolic, awarded to two people who represent a broader effort. Of course, the main reason the Higgs boson is of interest right now is the experimental work done in finding it! Could there be a Nobel Prize for that? Well, I can’t see any way to award an individual for the efforts of thousands of people over decades. An untold number of “little” problems have been solved by those people in building a bigger and better accelerator, and bigger and better detectors, than have ever been built before. So what I would like to see is the Nobel Committee changing its traditions and awarding the physics prize to CERN along with the theorists. A prize to CERN would again be symbolic. Not everyone who made important contributions to finding the Higgs works at CERN. Thousands of the contributors worked at United States labs and universities from the very beginning, for example. 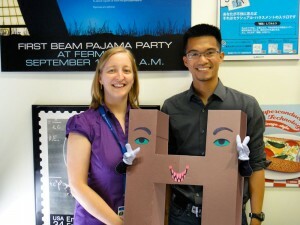 But as the center of the LHC effort, it does represent all that work. Not a sudden flash of genius, but lots of hardworking people tackling tough scientific and technical problems. In other words, the way great science is usually done. For a more humorous take on all this, please see this Scientific American article on the early awarding of the prize to the boson itself. My favorite bit is this: “A member of CERN’s PR division also wore a large, squishy Higgs costume, doing his best to mimic the behavior of the fleeting particle as he whizzed from one end of the room to another, hid and emerged from behind a curtain and breathlessly answered questions about gauge symmetry and vacuum fluctuations.” As you can see at right, this is frighteningly close to what some USLHC communicators have actually been involved in. 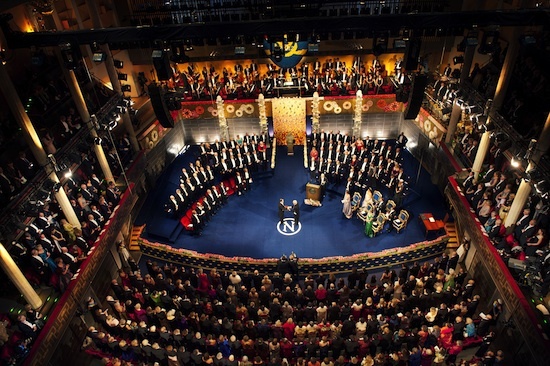 The real Nobel Prize in Physics will be announced next Tuesday, October 8. So stay tuned! Winning a Nobel Prize is difficult enough. But on the campus of the University of California, Berkeley, there is something that might be even more difficult to get: a parking space on the central campus. 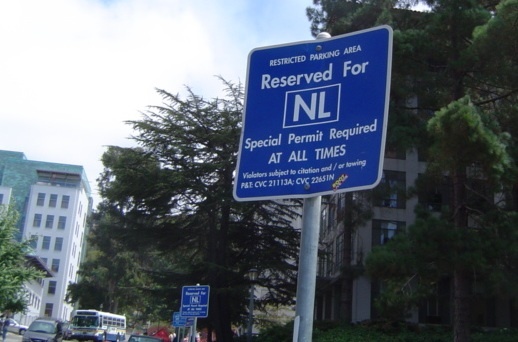 That’s why Berkeley has made it a practice to offer its Nobel laureates an extra-special perk: a free lifetime permit to park in the highly coveted spaces near the central campus. The spots would normally cost about $1,500 a year.